Seit Dezember 2000 ist unser Unternehmen nach dem Qualitätssicherungssystem DIN ISO9001 zertifiziert. Damit ist für Sie als Kunde sichergestellet, dass Sie stehts mit der gleichen guten Qualität beliefert werden. Das Zertifikat können Sie sich auch als PDF-File herunterladen. We are not complicated. We just wanna be the best. 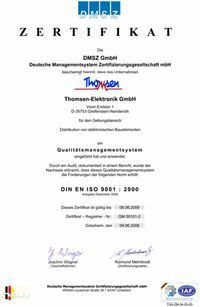 Thomsen is a leading electronic components distributor and broker acting across Europe. With an anual revenue of ~ € 6. Mio. and more than 25 years experience Thomsen provides all areas of the electronic industry such as active, passive, electromechanic and optoelectronic components. Thomsen offers you an ever growing sales network with currently more than 600 customers worldwide. With a complete understanding of the mechanism of the electronic market we focus on technical support for our customers and on demand creation for our suppliers. Rapid changes in technologies and market conditions are our daily business. Adaptability, Reliability and Accuracy in services and expertise are the benefit to our partners.